And,Seiemon Kuroda assumed the position of the founder representative director. The factory was operated as each division factory in Miki-city Hyogo, Sanjo-city Niigata Pref, and Sennan-gun Osaka Pref and Ikuno-ku Osaka-City. The head office in Osaka City was burnt down due to war damage. 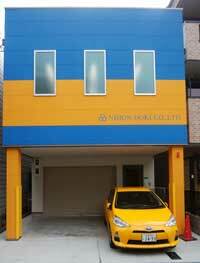 The head office office was relocated to Higashinari-ku, Osaka-city. Each amount factory became independent respectively, and the separation was based on the statute of the purport made into the business entity of each office unit by the Measurement Law revision. The enterprise was reorganized as NIHON DOKI CO.,LTD. with the factory and office in Ikuno-ku, Osaka-city. Katsumi Fujita assumed the position of the representative director. JIS display authorization was received at the factory in Ikuno-ku, Osaka-city. The factory was relocated to Izumisano-city, Osaka. Masahiro Fujita assumed the position of the representative director. The Izumisano factory was completely rebuilt. The Osaka office was established. The Rinku factory was constructed. The Head office and factory was constructed.